In 2013, as part of the North of Invention conference (organized by Sarah Dowling and Charles Bernstein), poet Jordan Scott gave a presentation entitled “The State of Talk: Notes towards Speech Dysfluencies and State Interrogation Procedures and Techniques.” To much acclaim, Scott discusses the “lateral step” that he takes from his book Blert (2008) to consider “expanded notions of disfluencies as applied to the procedures of interrogation.” The talk maps a trajectory for his poetics that shifts from a personal exploration of the stutter in Blert (2008) toward this related linguistic terrain of stuttering elsewhere. 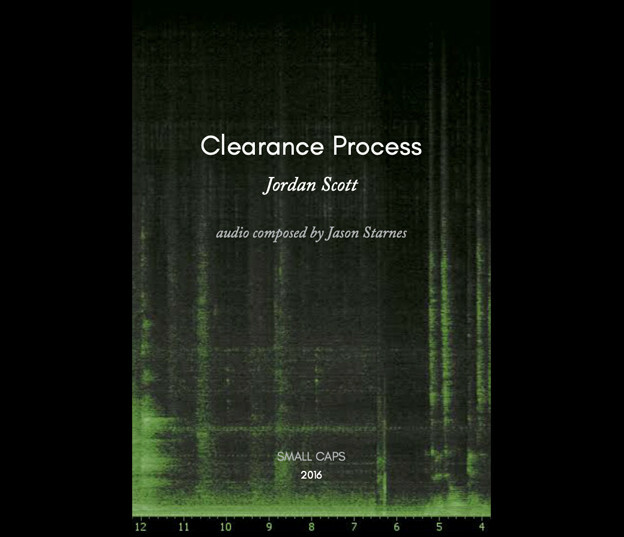 Clearance Process (2016), which stems from Scott’s research into the stutter, dysfluency, and interrogation, is a multimedia chapbook which captures the five days Scott spent touring the Guantanamo Bay Detention Center (GTMO) in April 2015. It appears to be one of the numerous, exceptional offerings from his line of inquiry. The book itself, published exclusively in a digital format by The Capilano Review as part of their SMALL CAPS series, is comprised of a forward by Scott that details the process of admission to tour GTMO, a powerful excerpt from Guantanamo Diary (2015) by Mohamedou Ould Slahi, an audio composition by Jason Starnes, and a series of striking, Operational Security (OPSEC) approved photographs. Clearance Process is dedicated to Slahi, a Mauritania-born man who was detained in GTMO from 2002 until his release on October 17, 2016, without charge. Having listened to “The State of Talk” before engaging Clearance Process, I was uneasy with the prospect of confronting the very unsettling but very real techniques of torture and interrogation. Torture isn’t in the foreground here, but it haunts the entire book. Though Clearance Process is still disquieting, it is the quietude of the collection that is perhaps most affective. If Blert is a book that, as Tyrone Williams describes, captures the “momentary loss of control, of agency” in the moment of the stutter, then Clearance Process engages different losses of agency — the voluntary and the forced, both a product of the systemic operations of a space like GTMO. Lingusitic communication in Starnes’s accompanying composition, embedded in the digital publication, captures this with its hauntingly sparse soundscape. Clearance Process’s soundtrack is composed of ambient sound — crackles, echoes, chirps, and buzzes from the space. The few voices on the recording are distant and muffled, interrupted by hums and clangs: “this goes through the nose and down into the stomach to provide the [inaudible].” What few voices there are drift in and out of audibility, a likely result of the restrictions in place according to detention center policies. That’s not in my lane. I don’t know what they’ve done or what they haven’t done. I’m not privy to that information. I’m not authorized to tell you that, sir. I can’t speak to that. But I’ll see if I can find someone who can. Each seemingly scripted line, presumably uttered by one of the workers of the detention complex, is not necessarily a stutter, but a stoppage, a distraction, a deviation in speech; it is language detained by saying. Eric Schmaltz is a poet, artist, scholar, and educator. He holds a PhD in English from York University where he specialized in experimental and avant-garde literatures in Canada. For the 2018–2019 academic year, Eric is a SSHRC Postdoctoral Fellow at the University of Pennsylvania where he is engaged in research on sound and poetry. He is the writer of Surfaces (2018), a collection of visual poetry and text-art that intervenes into the legacies of media-based poetics. His creative work has appeared in periodicals such as The Capilano Review, the Berkeley Poetry Review, Vallum, and Lemon Hound and has been exhibited in Buffalo, Philadelphia, St. Catharines, Toronto, and Vancouver. This series of short documents engages the intersection of sound studies, orality, and various poetic modalities with a focus on poets working within the area lines of Canada. As research in process, each of these commentaries reflects upon the possibilities afforded by emphasizing the mouth in poetry and how the mouth as a site of creative expression can divergently engage processes of cultural meaning-making.